For more information on the glass of Thornhill, please click here. The medieval stained glass has been called the finest display in the north of England, outside the City of York. In the Savile Chapel two windows in the north wall have glass of 1447, one with a crucifixion, and the other including the figures of Thomas and Lady Savile, along with a request for prayers for their souls. The third window in the same wall, of 1493, shows scenes from the life of the Virgin. The east window of the chapel is a 'Resurrection’ window. The great east window of the Chancel, thought to be the work of French or Belgian craftsmen, shows another common medieval subject, the Tree of Jesse, illustrating the human descent of Christ from Jesse, the father of King David. The glass here was restored in the year 2000 and protected inside and outside. 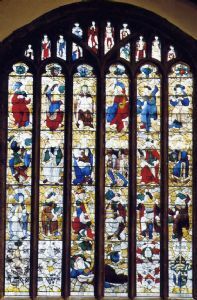 See the link below for a recent article on the East window. We do not think there was ever coke heating in the church as suggested in this article - we are almost on top of local coal mines and coal was delivered free as required. Further information about the window is available here on Vidimus' website. Vidimus is an online magasine devoted to medieval stained glass.